A fascinating cross-pollination of cultures, Gunman in the Streets came near the end of the traditional film noir era when the nihilist movie trend began to turn in on itself in films like Kiss Me Deadly. 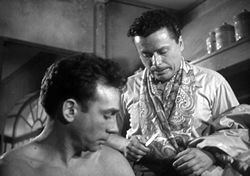 A sort of tough guy twist on Hitchcock's Notorious with a few ripples of feminism (before such a thing even really existed), Gunman was shot in both English and French versions; the former is represented on this DVD and was directed by noir veteran Frank Tuttle (This Gun for Hire). Never shown in the U.S. until a repertory appearance last year, the film's enjoyment level will depend primarily on how familiar you are with both noir in America and its strong influence on European directors like Jean-Luc Godard, Jules Dassin, and Francois Truffaut. 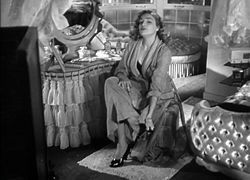 Our downhill story follows the attempts of crime moll/high society dame Denise (Diabolique's Simone Signoret) as she attempts to arrange for the escape of her lover, incarcerated bank robber Eddy Roback (Destination Tokyo's Dane Clark), who has been sent up the river along with his gang of cohorts by the dogged Inspector Dufresne (Fernand Gravet). Denise uses her charms on naive reporter Frank Clinton (Robert Duke), whose role in Eddy's getaway proves to be far more complicated than Denise originally intended. A perfectly respectable and accomplished crime film, Gunman in the Streets is more stylish and intriguing than the Scarface-style cover art might lead consumers to believe. 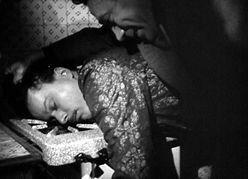 The Parisian setting adds considerably to the novelty value, but the real trump card of course is the young Signoret, who was shortly to become an international star. Despite its lack of a U.S. release, the film was evidently successful enough to merit a remake twenty-five years later by Serge Leroy, starring Mimsy Farmer and Michel Lonsdale under its original French title, La Traque. Once again AllDay has given the royal treatment to a title most other studios would have probably shrugged off. Their transfer of Gunman is a class act all the way, retaining all of the luster in the original black and white photography while admirably capturing the grit of the street scenes. According to a 43 second supplement reel, the film was censored upon export to the U.K. but is presented intact here; the extra bits of brutality mostly involve some pulled punches and a protracted bullet removal sequence, mostly shown in apostrophe. The violence is low by today's standards, but it's easy to see how some of the queasier moments might have been a bit much at the time. Extras include the aforementioned censor reel, a photo gallery of (mostly awful) poster art and stills, production notes, and a nice booklet consisting of the original pressbook art.